I’m usually quite heavy with auroras (here known as the aurora borealis), phenomena of the planet’s magnetosphere (in our case the Earth) against the electrically charged particles from the sun. Obviously, the magnetosphere of a planet depends on its core, as this, how active this and the rotation of the planet and it is very common that all the planets have their own (if, satellites as well). A more iron or ferrous material and more pressure, more magnetosphere. Saturn (the rings) next to Mars have been among the first planet in the solar system where auroras have been no problem. In fact, Jupiter has a perennial at the north pole of the planet … but of course, Jupiter and Jupiter’s gravity is enormous. 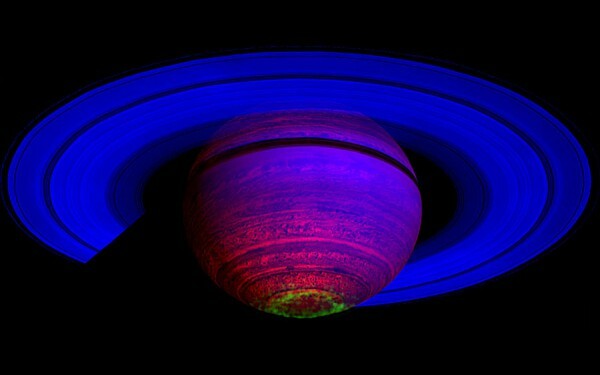 By the way, the image is an image in infrared Saturn, hence those colors. And Saturn (as in Jupiter and Pluto) the magnetosphere the planet depends largely on the many satellites that change the orientation of the magnetic field.